When designing, developing and optimizing your landing page, there are many things you must take into consideration. Although developing an effective inbound marketing campaign is crucial to attracting and driving visitors to your landing page, it is also important that you couple your inbound marketing strategies with all of the following SEO best practices when developing a landing page. Chad Pollitt discussed the SEO benefits of deploying a landing page as a microsite last year. The primary benefit would be optimizing your microsite for select keywords related to your landing page and offer. As Chad put it, "They allow you to focus exclusively on a select few keyword phrases. These phrases tend to be highly significant to Google's Webmaster Tools". Done right, with a keyword-rich URL (not a subdomain) and all of the usual on-page SEO focused on your keyword(s), this strategy can drive qualified traffic to your landing page via search. The downside includes the amount of effort and cost that may be needed to set up your microsite for a single landing page or suite of A/B tests. To compliment your inbound marketing efforts, it is important that your landing page is SEO optimized and filled with well-written, researched and relevant content that your visitors will find extremely engaging and useful. By filling your landing page with high-quality, useful and relevant content, you will make all of your visitors feel welcomed and encourage them to stay longer. By using the same keywords in social media, blog posts and press releases designed to drive traffic to your landing page, you stand a much better chance of ranking well on Google for your target keywords, especially since the Panda release. One of the top SEO best practices used by successful Internet marketers when optimizing their landing page is to use keyword optimized headlines and sub headlines to make their landing page standout. The main benefit of using headlines and sub headlines on your landing page is that visitors who are not interested in reading the content can easily scan the page by reading the headlines to pinpoint specific information or offers they are looking for. In addition to using attention-grabbing headlines, sub headlines and high-quality content, visitors must be prompted and encouraged to take the next step. By placing attention-grabbing calls-to-action, for example an arrow pointing to your lead capture form or instructions in bold text, you will be on your way to increasing your conversion rates. Try different versions via graphics, headlines and different layouts via A/B split testing to optimize your conversion rates. Another SEO best practice is to place a video or photograph on a landing page. Although videos are more effective than photographs, a high-quality relevant photograph or infographic will work well to capture the attention of your visitors and inform them of the value of the offer. Make sure you include your keywords in the titles, image names, descriptions, URL’s and alt tags of any images or videos used. To increase conversion rates and attract more visitors, consider the benefits of incorporating social networking and media widgets and buttons on your landing page. By using these social networking and media resources on your landing page, you encourage visitors to share your landing page offer with their friends and followers, a form of viral marketing. Since the number of visitors to your landing page is something that the Google search engine algorithm takes into consideration when ranking a landing page, you should consider offering your visitors an incentive to return. You may want to consider updating your landing page periodically with discounts, prizes or exclusive offers. The key to success online is to make certain that you use effective inbound marketing strategies coupled with all the SEO best practices when developing your landing pages. While inbound marketing is effective at driving traffic to a landing page, you should be optimizing your landing pages for search as well. 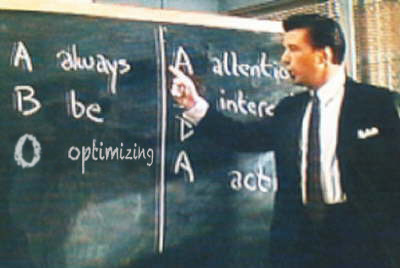 As Chad says, “Always Be Optimizing”, like Glengarry Glen Ross. By doing so, you will be on your way to increasing your conversion rates by capturing the attention of your visitors and encouraging them to become new customers or clients.